KATHMANDU, July 22: Noted members of civil society including a former chief justice, human rights activists, cinema actors, doctors, lawyers and representatives of various professions as well as other sectors took to the street at Baneshwar on Saturday to press the government to address the demands of Dr Govinda KC, who is on the 22nd day of his 15th fast-unto-death. 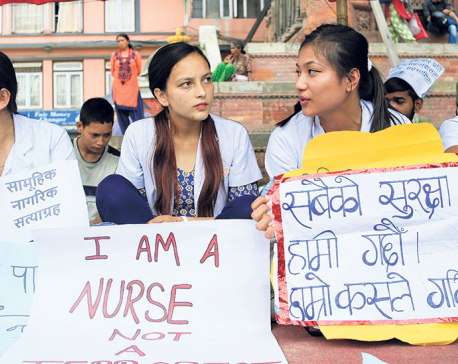 Dr KC is pressing for reforms in medical education. 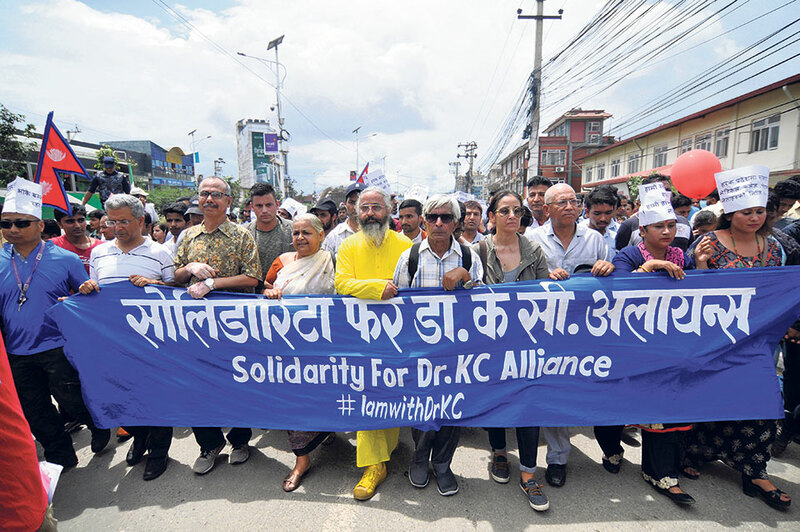 The civil society leaders were at the head of rallies of members of the general public who gathered spontaneously in their hundreds at Baneshwar in response to a call by the Solidarity for Dr Govinda KC Alliance (SDGA), an organization formed to support the demands of the crusading doctor. The alliance demonstration drew political leaders from various parts of the ideological spectrum, celebrities, medical students and doctors, and members of the general public. The participants of the demonstration, which was dubbed a ‘balloon protest’, marched from Maitighar Mandala through Babarmahal and Bijulibazar to New Baneshwar, where it converged into a rally that expressed solidarity with Dr KC. Addressing the rally at New Baneshwar, former chief justice Sushila Karki stressed that the government absolutely must address Dr KC’s demands, which were not for his personal benefit but for the larger interest of the entire country. “The government is acting like it doesn’t understand this, but the people have already understood it very well,” she said adding that the government should act now and relieve the plight of the people. Karki also contrasted the decisions of the government to what should have been their own priority under socialism. She said, “We need not teach the politicians what socialism is, they already know. Human rights activist Krishna Pahadi accused the Nepal Communist Party (NCP)-led government of working contrary to the constitution, the rule of law and the sovereignty of the people. “Where is the inclusion of 33 percent women in the party? Why is the post of deputy speaker not being given to the opposition party? What authority does the government have to amnesty a criminal sentenced to jail by the courts?” Pahadi asked. 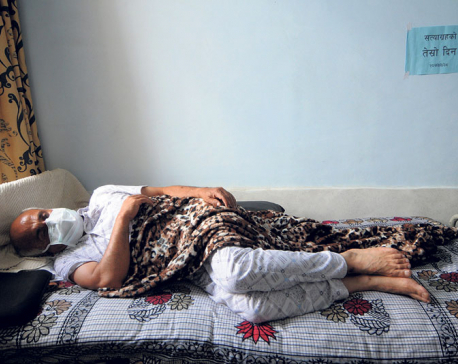 He also warned the government that the protests may further flare up if Dr KC’s demands are ignored. Pahadi’s speech was punctuated by the firing of tear gas shells at Nepal Tarun Dal cadres who were trying to force their way into the prohibited zone alongside the peaceful protest by SDGA. 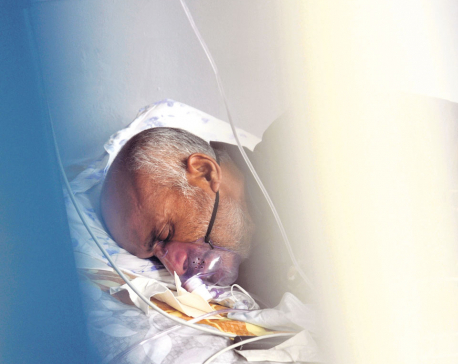 Writer Khagendra Sangroula claimed that the protestors didn’t need to ask the government to save Dr KC’s life as he was now already immortal . “I have not come here to beg for Dr KC’s life, I have come to ask Oli and Pushpa Kamal Dahal to save their own good name,” he said. According to him, both those leaders have put their integrity in jeopardy through their involvement with various mafia groups. The SDGA demonstration was participated by celebrities, civil society activists and political leaders including Nepali Congress leader and former minister Gagan Thapa (who opted not to speak at the rally), Naya Shakti Party leader and former prime minister Baburam Bhattarai, former minister Hisila Yami, actress Karishma Manadhar, and Bibeksheel Sajha Party leaders Rabindra Mishra, Ujjwal Thapa, Bijay Babu Shiwakoti, Milan Pandey and Ranju Darshana. During the rally, the protesters likened Prime Minister KP Oli with the Rana prime ministers of yesteryear and chanted slogans against the government. They held placards reading “Nepalese in pain, Oli government in enjoyment”, “Respect the human rights of Dr KC”, “Stop use of force against Dr KC” and “We don’t need any mafia-friendly government”.